1. Research cabinets, styles, and features. If you are reading this you most likely have already started the research process. You don’t have to do thesis quality research, just get inspired. Create an idea book with magazine or catalog cut outs of styles, colors, and features that you want to incorporate into your new kitchen. Reference our how to measure your kitchen page and get to work. Remember this doesn’t have to be a work of art, just a legible layout for us to get started with. Pictures are worth a thousand words. Take a couple wide angle photos to share with your kitchen designer. Meet with one of our champion kitchen designers at our Tacoma or Bremerton design center (click here for directions) and discuss your remodel. During this visit we will provide you with an in depth review of our cabinet lines, quartz and granite countertops, and the numerous options that are available within your budget. The goal of this meeting is for us to learn as much about your project, your needs and goals, make some preliminary product selections, and establish a rudementary budget for your project. Make sure to bring your idea book! You will leave this meeting with a good understanding of the price ranges available for your project. Once we have a basic understanding of your project and budgetary goals, we can get to work on your design. The first step is for us to come measure your project and get a feel for your space. After we have measured your space, we upload your measurements into an autocad type software specifically designed for cabinet layouts. We typically spend between 4-6 hours designing your kitchen with the software based upon the information we learned during our Initial Design Consulation. There is a $250.00 design retainer fee that is required before we start your design. This fee is required whether we are measuring your space or not, and simply ensures that we can dedicate the appropriate amount of time to your kitchen design by only completing designs for customers that are serious about moving forward with their project. Should you decide to move forward with your cabinet purchase, the $250.00 is credited towards your cabinet order. 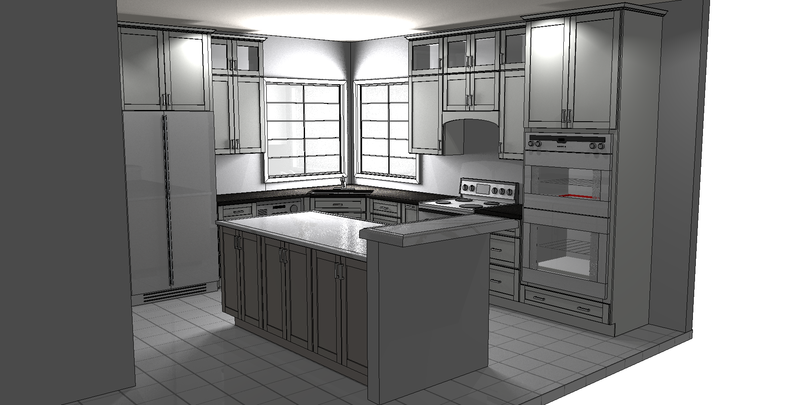 We take all the information we learned from you during the initial design consulation and pour it into a kitchen cabinet layout and complete a series of 3D renderings to share with you. This process generally takes about a week, depending upon the complexity of the design. When we have your new kitchen design ready we will schedule another meeting with you to review the cabinet layout, countertop selections, and final pricing with you. We go through each element of the design, cabinet by cabinet to make sure you are getting the kitchen you've dreamed of. We never expect you to make a purchasing decision at the design review. In fact we discourage it. We want you to take our design home and review the proposed layout in your space. Imagine where you will keep your pots and pans, your baking sheets and your silverware. Where will that pesky crockpot go? Visualize the flow of your new kitchen. The key to a successful kitchen remodel is not only that it looks great, but that it functions and stores beautifully as well. If you would like to move forward, contact your designer and schedule a follow up appointment to make any necessary changes to the design. After all the pieces are in place, its time to place your order. Because all cabinets are made to order and are non-refundable, all cabinet orders must be paid in full at the time of the order. Installation may be paid upon completion. It typically takes 4-6 weeks to build your new cabinets. During this time make all the preparations for your new kitchen. Get a cabinet ready checklist from your designer. If you end up needing a little more time before you are ready for delivery, we can store the cabinets in our conditioned warehouse located in Tacoma for up to 4 weeks free of charge. Cabinet installation is typically a major milestone in any kitchen remodel or new build. If you have hired New Leaf to complete your cabinet and/or countertop install then you are in the hands of expert craftsmen. If you have hired an outside contractor or are completing the work yourself, you can reference our cabinet installation instructions. We are also always available by phone for any installation support questions. 10. Enjoy your new kitchen!!! Completing a kitchen remodel or building a new home involves a lot of excitement and stress, but there is nothing like the feeling of cooking that first meal or throwing that first party. One of my favorite things about owning this business is not only seeing the look on a customers face after the work is done, but also seeing customers years after their project is completed and hearing how much they enjoy their new kitchen. I can't wait to work with you! Please contact us today and start the process.